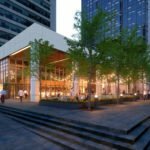 New renderings of stacked cube office tower at 400 W. Georgia St. 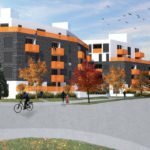 The Budget car rental building site at West Georgia and Homer streets in downtown Vancouver will soon be home to a new building with a daring design. 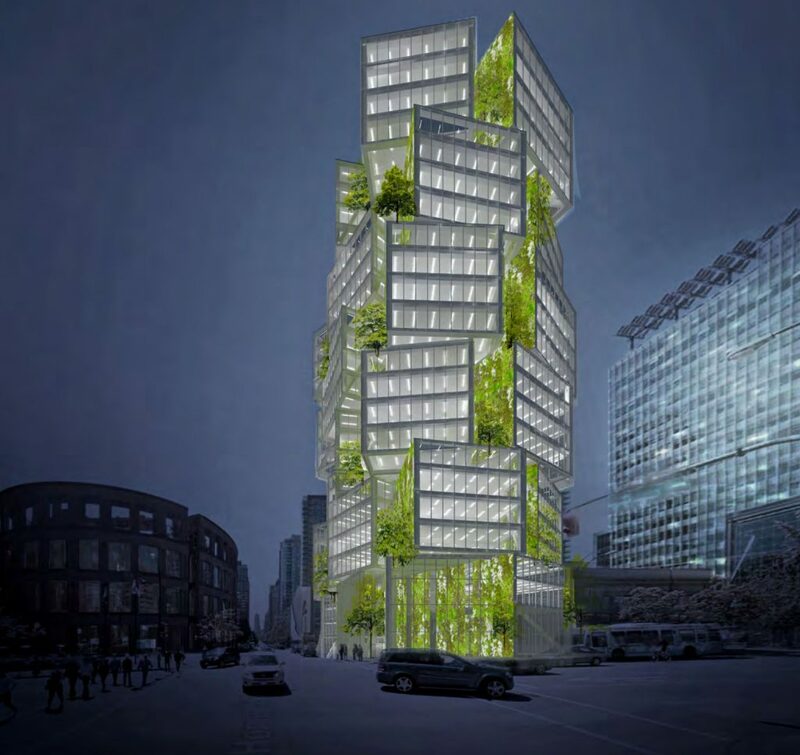 Developer Westbank, Allied REIT and Merrick Architecture are proposing a spectacular, 24-storey office tower made up of several clusters of four-storey, steel-framed cubes, arranged around a central concrete core. 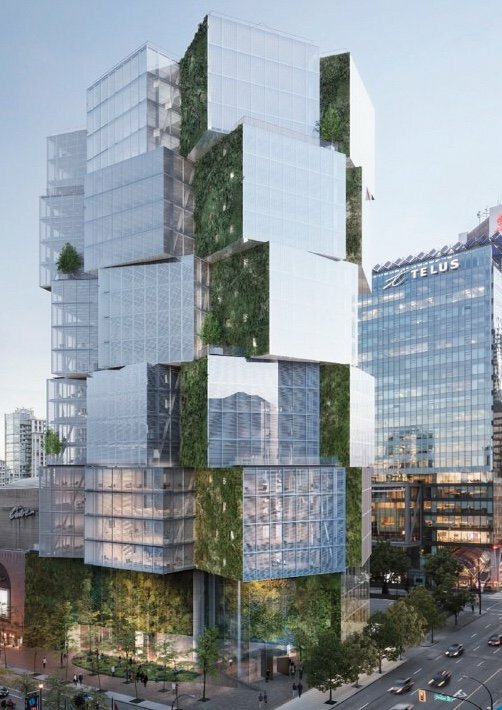 The City of Vancouver held an open house for the upcoming office tower this afternoon, and showed off new models and renderings of the project. Dramatic tower lobby entrance at West Georgia and Homer Street. Rendering of tower showing relationship to L’Hermitage condominium building and vacant lot. Rendering looking up at tower from Homer Street. Model of 400 West Georgia, showing Homer Street frontage. Model of 400 West Georgia office tower by Westbank and Allied. 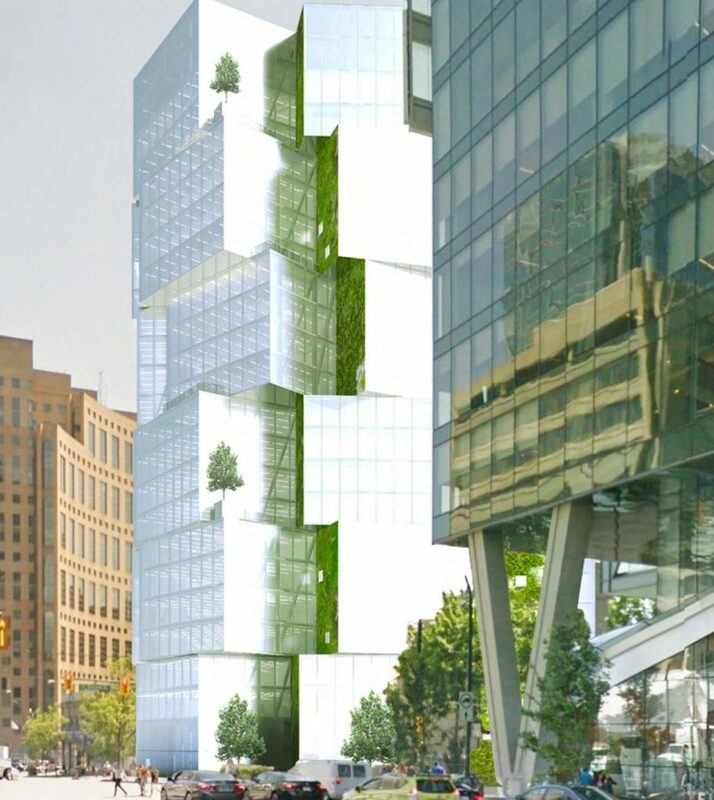 The spaces in between the cubes will be home to hydroponic living walls of foliage, as well as water features. The building will contain 350,000 square feet of office space, some of which will have glass floors, as well as a soaring four-storey glass lobby. There will also be a cafe or restaurant on the ground floor, and extensive landscaping of the public realm surrounding the building, including pavers, seating, lighting and upgrading of the laneway. There will also be a garden and amenity space on the roof of the building for office tenants. 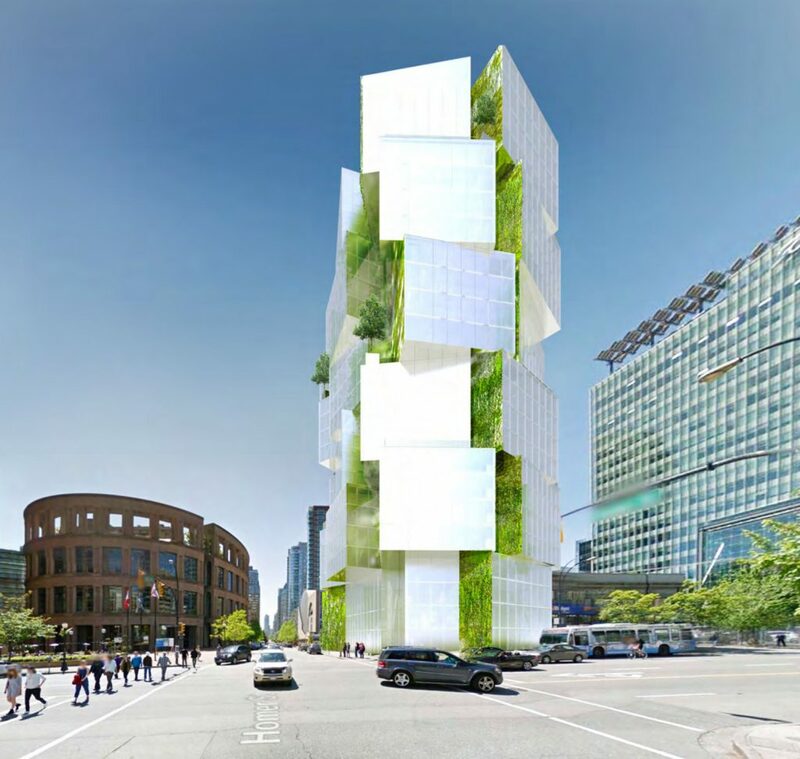 Westbank says the unique design will set the standard for future office developments in Vancouver, and that the large column-free floor plates will be attractive to high-tech companies. 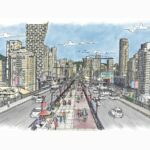 The building will designed to a LEED Platinum standard, and Westbank hopes the project will become a landmark at the eastern gateway to downtown, which is set to be transformed with the removal of the viaducts. 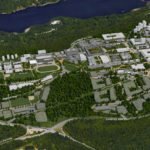 It will be built “on spec”, meaning no major tenant is lined up for the project, but that shouldn’t be a problem — several major tech companies including Amazon are rumoured to be looking for more space in the area. 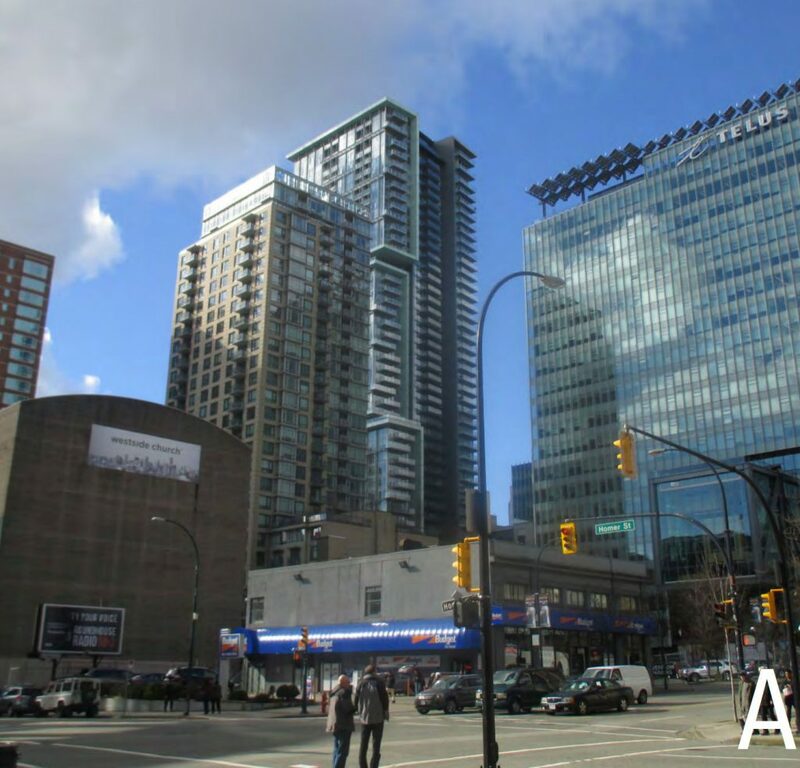 It’s not clear how the project at 400 West Georgia will affect future redevelopment of the site across the laneway at the corner of West Georgia and Richards Street. The lot is owned by Austreville Properties, which also owns the Pacific Palisades rental apartment complex. 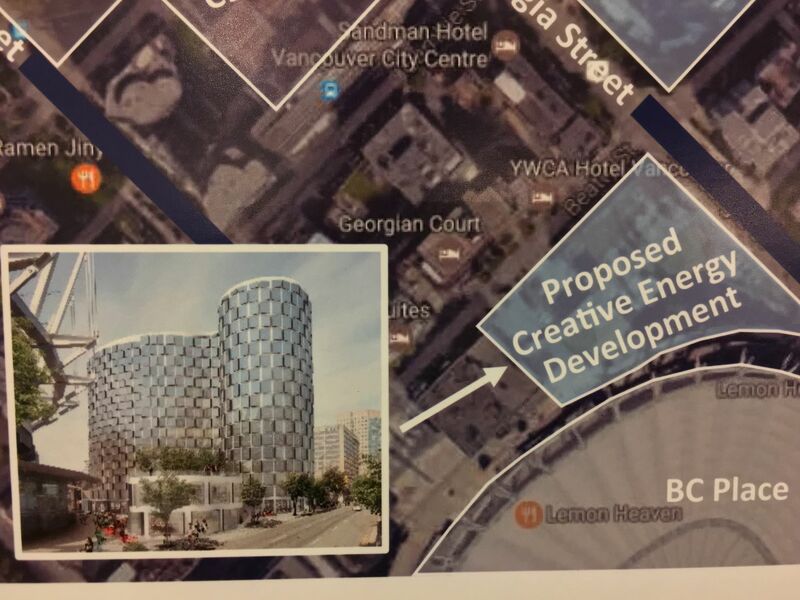 There are several proposed and future development projects in the area including the redevelopment of the Canada Post site, and the future home of the Vancouver Art Gallery at Hamilton and West Georgia Street. 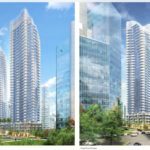 Westbank is also proposing a new development at the site of the Central Steam plant at Beatty and West Georgia Street, and a rendering was shown at the most recent open house for 400 West Georgia. Photo of upcoming proposal at the Central Steam Plant site at 720 Beatty Street. The existing building on the site – formerly home to Budget Car Rental — was constructed in 1913, but it is not protected by a heritage designation. 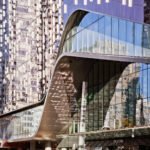 Rendering of 400 West Georgia in daylight hours. Rendering of 400 West Georgia at night. The building will feature glass floors on some levels. Homer Street view, looking upwards showing the green wall and unique design. 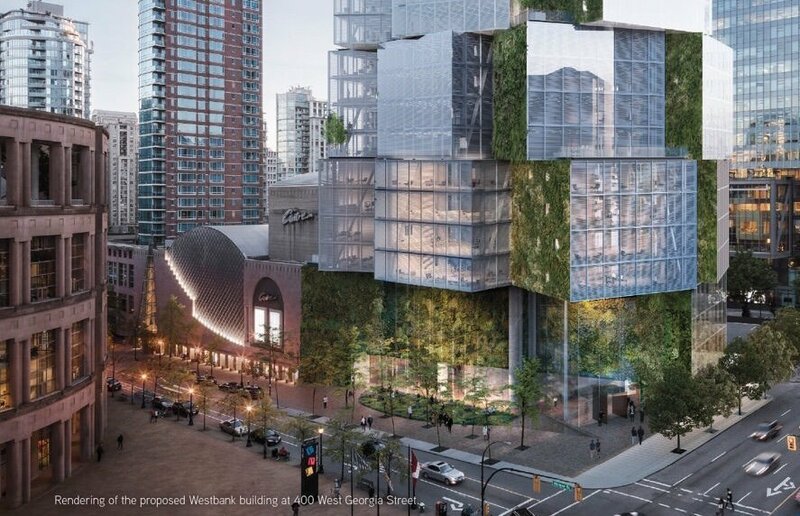 Rendering of the new office tower showing the library and also another Westbank project, Telus Garden. The current Budget car rental building, which is over 100 years old.